“With A Camera“. With each blog post in this new series we describe an application of close range photogrammetry – that is, 3D measurement and modeling with a camera. The articles will describe significant real-world problems and how photogrammetry was able to uniquely solve them. Future topics might include engineering, surveying, architecture, construction, drones, mining, agriculture, forensics, scientific and industrial measurement, and archaeology. In each post, we will summarize the problem, how it was solved, and as well point out resources on the web for further study. The first post of this new ‘With A Camera’ series is the interesting one of measuring accident and collision scenes. 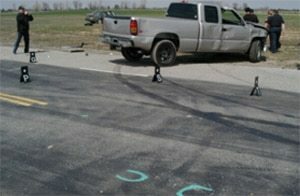 The process of reconstructing a traffic accident to determine who caused it demands detailed accident scene diagrams and often a determination of key causes, such as speed. Some of the details that are required include positions of the vehicles involved in the accident, skid mark locations, roadway features, and impact locations. It is challenging to create accurate collision scene diagrams and keep road closures to a minimum while ensuring investigator safety. It is even more challenging when creating these diagrams from a limited number of photographs that you did not take! Photogrammetry allows incident investigators and traffic accident reconstructionists to create scaled collision scene diagrams from scene photos they took and as well from unknown photo sources. 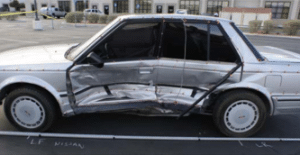 To determine vehicle speed at impact, measuring the crush of a vehicle can be important. It is difficult to obtain highly accurate vehicle crush measurements using physical inspection equipment such as tape measures, crush deformation jigs, and measuring poles. These techniques use a “guessed” pre-impact boundary shape/position. In comparison, photogrammetry utilizes known pre-impact and post-impact positions. Studies have shown that photogrammetry provides more accurate results as compared to hands-on physical measurements. Collision scenes are documented by two parties. One group are incident investigators usually attached to the police force, and the other are 3rd party reconstructionists. Traffic accident reconstructionists are usually not available at the scene immediately after the accident has occurred. 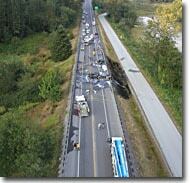 They visit the collision scene when the debris has already been washed away and skid marks cleared. In many cases, they rely on unknown images to create scaled road diagrams. This page on mapping accident scenes describes how PhotoModeler is used to create accident scene diagrams. To create accident scene diagrams from an unknown photograph, reconstructionists can use new photographs they take during site investigation together with the old photographs taken at the time of the incident by the police or other parties such as bystanders. Although the new photographs lack critical details of the incident that has long been cleared, they share common reference points with the old photographs. These discrete points may include lane lines, light posts, street corners, and other identifiable marks. To create accurate collision scene diagrams, the characteristics of the camera used to capture the unknown photograph are required. These characteristics are obtained through a process known as inverse camera. 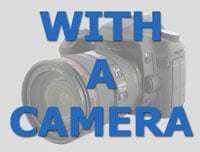 This process is used to determine the focal length, position, and orientation of the camera. The process involves identifying control points in the old photographs, determining real world coordinates, and solving a set of equations to obtain the unknown camera characteristics. After obtaining the unknown characteristics, the next step entails finding the relationship between the old photograph and the surface of the object in 3D space through a process known as photographic rectification. The obtained three-dimensional relationship is used to generate a re-mapping of the surface. PhotoModeler allows accident reconstructionists to perform both inverse camera projection and photographic rectification. This paper on diagramming an accident scene describes how photogrammetry is used to create accurate collision scene diagrams. To help determine the speed of collision (which can help with causation), measuring the amount of crush on a vehicle can be helpful, as can measuring skid mark length. There exists a linear relationship between vehicle crush and the equivalent barrier speed. To start with, reconstructionists obtain crush measurements that they use to compute crush energy. The equivalent barrier speed is then computed directly from crush energy. Some of the common techniques of measuring crush include measuring poles, grid, tape measures, and photogrammetry. Except for the photogrammetric method, all the other techniques use “guessed” pre-impact boundary position/shape. The photogrammetric technique uses known pre-impact boundary position/shape and post-impact boundary shape/position for crush measurement. This process involves creating 3-D models of both cases and then superimposing them to obtain crush measurements. After obtaining the measurements, the vehicle stiffness data is used to compute crush energy. Correlation method is then used to determine pre-impact speed from the crush energy. This paper on determining equivalent barrier speeds describes how PhotoModeler is used in vehicle crush measurement. Studies have established that both physical inspection and photogrammetric analysis are suitable techniques for measuring vehicle damage. However, according to the findings of the study described in this research paper, photogrammetric analysis provides more accurate results as compared to hands-on measurement techniques. In addition, the technique is more convenient and inexpensive. Photogrammetry allows car accident reconstructionists to create accurate scene diagrams from known and unknown photographs. This process involves using photographs provided by the police and 3rd parties, and new photographs that are taken by the reconstruction team during the site investigation. In addition, photogrammetry enables traffic accident reconstruction experts to accurately measure vehicle crush and determine equivalent barrier speeds. Recently, the use of drones and UAVs has picked up in scene diagramming because photogrammetry provides the perfect measurement and diagramming tool from drone photography. In addition, here are more articles on applications of photogrammetry in forensics and car accident reconstruction.